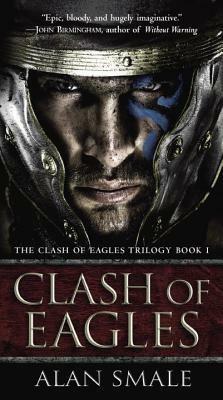 When I picked up Clash of Eagles, I thought the idea had merit. The Roman Empire remained strong and alive past its original fall and finally managed to work its way over to the North American continent. Just like the Europeans from our history, they encountered the Native Americans who vehemently protected their native land from foreign invaders. Basically: Romans vs. Indians. Since the timeframe for this book was a few centuries after the original fall of Rome, I was expecting a bit more in terms of this alternate history but was ultimately disappointed with the result. While a lot can change in a few hundred years, the Romans remained mostly the same. Sure, the Native Americans had some impressive new technology, but then the narrative felt pretty one-sided. Since the book focused on the advancing Roman troops, I had trouble latching on to the main character for the first 20% of this book, because none of them stood out. Once one was forcefully given to me, I realized that this book was basically going to be another version of Dances with Wolves (1990) or Avatar (2009). Consequently, that’s when I dreaded having to read this book. I read a few chapters into Part 2, but then flipped ahead and saw that the three parts of this book covered 25%, 50%, and 25% of the narrative, respectively. This told me the book probably didn’t start in the right place, or at least spent too much time setting up something that ultimately didn’t matter. Maybe this book doesn’t turn into a Dances with Wolves clone, but spending so much of having to decode the Latin and Native American lingo turned off my interest by the time I made it 25% of the way through. I usually finish most books I start, but I didn’t want to force myself through this one. An interesting concept that fails to execute fast enough, I cannot give Clash of Eagles a rating.